The 8th chapter in the Shri Krishna Committee report -- which looked into the demand for the creation of Telangana state by bifurcating Andhra Pradesh -- apparently includes some controversial suggestions that were never made public. According to sources, the 8th chapter advises the state government to 'manage' the media to curb the movement and warns that if it approves the formation of Telangana, the state could become a bastion for right-wing forces, jihadi elements and Maoists. Supporters of Telangana are obviously upset with these suggestions and have demanded the arrest of Justice Srikrishna. The 8th chapter states that Telangana may become a hub for militant Hindutva forces, jihadi elements and the Naxal movement. The report goes on to warn that the All India Majlis-e Ittihad al-Muslimin may emerge as a strong party in Telangana and the new state may witness communal clashes. The chapter even suggests that the government should 'manage' the print and electronic media to curb the movement by giving lucrative advertisements to newspapers etc. The Srikrishna report even advises the government to deploy additional forces to curb the movement. Furious pro-Telangana activists want to know why the government chose not to make the 8th chapter public. The contents of the report were revealed when the high court, acting on a petition, ordered the government to make the report public. To add to the government's woes, the court had observed that the 8th chapter did indicate some amount of bias. The government has chosen to remain silent over the controversial chapter, but has stated its intent to appeal against the high court's order. 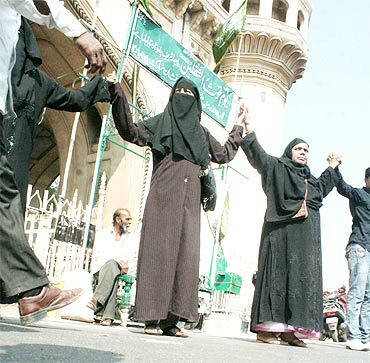 Lateef Mohammad Khan, who heads the Muslim Forum for Telangana, says that the outfit has faced pressure from the government not to make the report public. "We wanted to address the media about this issue but we received a call from the police asking us not to do so. We were told that there is no need to discuss this issue in public," he said. 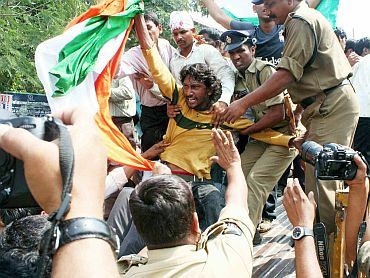 Dr Sangam Prithviraj, who heads the students' movement for Telangana, stated that the Srikrishna report is a biased one. "Chapter 8 has only vindicated my stand. If the Congress had nothing to hide, then why did it intentionally prevent a certain portion of the report from being made public," he queried. He added, "The report says that Telangana would become a Maoist den if a separate state is created. I want to ask them one question. 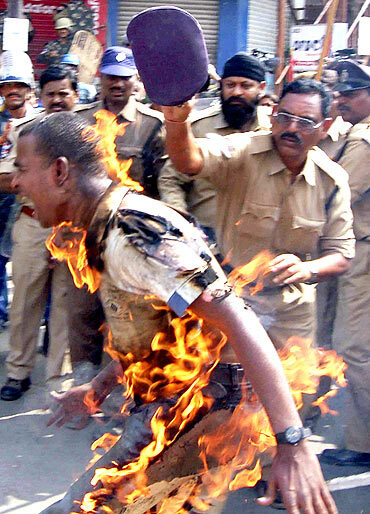 Chandrababu Naidu was attacked in the Andhra region by Naxalites. M Subbirami Reddy was shot in the Andhra region by Naxalites. What do they have to say about this? All this is just nonsense to curb the movement at the behest of the people of Rayalaseema-Andhra regions. They want to brand all the people of Telangana as Naxalites and underworld elements." "They should make this a public document if they have the guts. Frankly speaking, we were against the committee since day one since we were expecting a report to this effect. Today we want Justice Srikrishna to be put behind bars," said Dr Prithviraj. Khan added that the situation will become murkier in the days to come. He points out that Telangana Rashtra Samiti leader Samba Shivudu was recently murdered. "He was a strong leader who had command over the movement. Today, we suspect that the government could have gotten him killed. The suggestions in the report have already started taking effect," Khan said. Has the Congress decided on Telangana state?